Don't you just hate the mess that tangled unruly cords can create? Wouldn't it be nice if the cords on your appliances and tools were neat and untangled every time you went to use them. The Cord Clipster makes this possible. 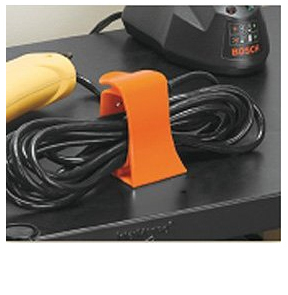 It is a unique little clamp that makes the job of keeping cords tidy incredibly easy. Cord Clipster holds tightly to bundled cords in order to keep them neat and organized when not in use. 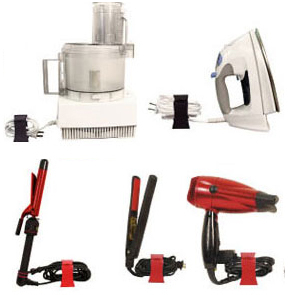 It is perfect for using in the kitchen or bathroom for small appliances, or out in the garage for power tools and extension cords. Take a couple into your office to straighten up the tangled mess of cords around your computer desk too. 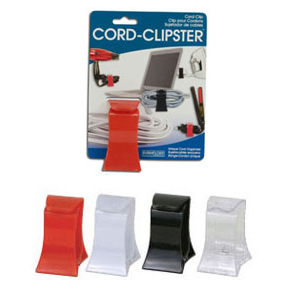 Cord Clipster features a unique design that allows for one handed operation, yet remains incredibly sturdy and secure. There are four different size adjustments to allow this clip to tighten in order to hold different size cord bundles. It is able to sit upright on flat surfaces too, so it really gives an organized look when holding your cords in place. This great little device ensures that all of your cords will be neat, untangled and ready to go when you need to use them. It is perfect for use in your garage, office, tool shed, basement, bathroom, living room and more. 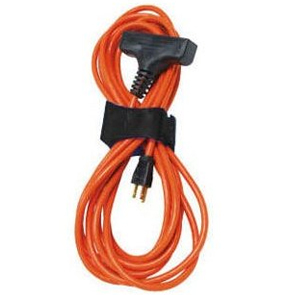 Just bundle up a cord and then clamp on a Cord Clipster to keep it from unraveling or making a mess. Use several to tidy up the cords behind your entertainment center, or use just a single clip to keep the cord on your hair dryer wound neatly for storage. You can even use a single clip to keep bundles of Christmas lights and other similar items organized for storage too. The Cord Clipster is great for keeping cords secure for space saving storage, but it can also be used to keep cords out of the way when working with power tools too. Unravel just the amount of cord you need to do the job, and keep the rest in a nice neat roll. This will prevent injury and accidents while making your job quicker and easier to perform. This is the small size clip. It is ideal for thinner cords resulting in smaller bundles. Use it for household appliances, power tools, and shorter extension cords. For a larger size clip that can hold even more, check out the small size clip called the Cord Clipper. It is more suited for larger bundles since it is able to expand to a bigger size. This simple little device is an incredible help when it comes to keeping cords organized, and it will make your space more tidy and less cluttered with cords and wires. Order Yours Today! Dimensions 2.75" x 2" x 1.5"
Cord Clipster - Keep your cords organized the easy way. Always have neat and untangled cords right when you need them.